Red is the hottest of all the warm colors. Red can have a physical effect, increasing the rate of respiration and raising blood pressure. In most cultures red means power, hence the red power tie for business people and the red carpet for celebrities and VIPs. In some cultures, red denotes purity, joy, and celebration. Red is the color of happiness and prosperity in China and may be used to attract good luck. Red gets attention: flashing red lights mean danger or emergency. Stop signs and lights are red to get drivers’ attention and alert them to the dangers of the intersection. In decorating, red is usually used as an accent. Decorators say that red furniture should be perfect since it will attract attention. 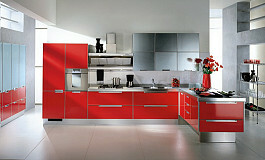 Red can have a dramatic effect in a room, whether used on the walls or as small accents in an otherwise neutral palette. The bright hue also energizes the room and sets the stage for convivial gatherings. 2007 is far from being over, but the new 2008 colors are already here. Let’s see the new transa as Debbie Zimmer, paint and color expert with The Rohm and Haas Paint Quality Institute sees them. Well, it’s not a great help to be honest, please help us a little, is there some guidance beyond “anything gooes” ? These kitchen island pictures present many different styles and ideas for islands that will help you create the perfect kitchen island for your layout. You’ll see a variety of materials used for cabinetry and countertop surfaces, including stainless, granite, marble and wood, that help tie the design with function. The many features of kitchen islands are also shown, including wine racks, storage cabinets, sinks, cooktops, eating areas and cooking areas. A beautiful addition to any kitchen, a pull-out faucets features a high arching spout that makes a strong design statement. Besides, it’s quite useful as well. These five faucets offer the latest designs from the best brands. Rather than cheap plastic parts, these are faucets with a solid steel construction for an exquisite finish and lasting durability. These faucets make cooking more convenient as large pots and pans fit beneath the high spouts and the pull-out hand spray can reach even the farthest corners of the sink. 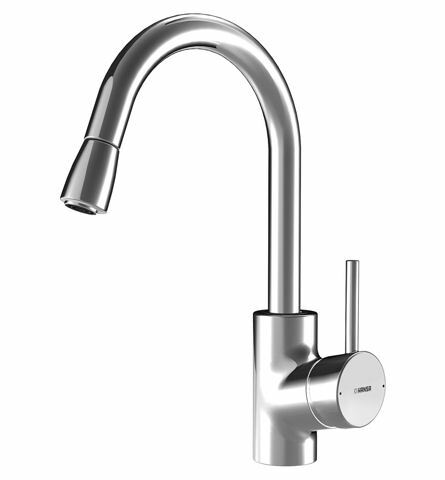 A tall faucet offers a highly visible presence with a trendy style. With gleaming finishes like stainless steel, matte platinum and polished chrome, the faucets have a solid functional elegance. These sharp kitchen pull out faucets will add both function and glamour to your kitchen. Kitchens that are larger, open and multi-functional are here to stay according to industry experts. A generation ago, the kitchen was the room where mom cooked meals alone. Now it’s the “centre of the home,” filled with family and friends. Instead of pricey fads like glass countertops and large-sized microwaves, look at these few kitchen design ideas that will be worth the time and money. A quick prep area with a small sink, cutting board and microwave or a larger sink in the island helps with gourmet cooking. Mixed and matched cabinet finishes, exotic woods, jewelry-like hardware and display areas that show off glass collections give the kitchen an eclectic look. Wrap-around desks that extend into the family room provide more space. 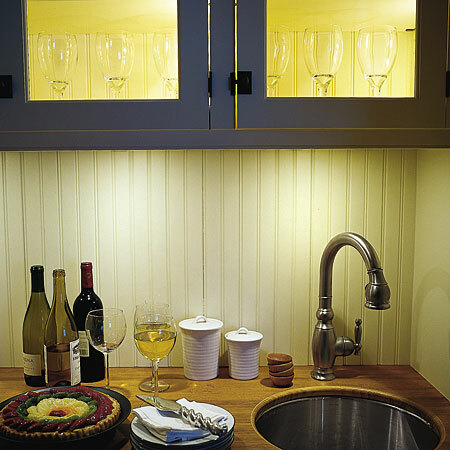 Cabinet storage for pull-down spice racks and buffet storage for beverage centers make the kitchen run more efficiently. And that’s a goal worth investing in. Yellow is a cheerful, uplifting color that is also known to help with digestion — making it a perfect choice for your kitchen! Blue is a calm, soothing color that not only lowers blood pressure, it is also known to decrease hunger. The perfect choice for a diet! Red is a stimulating, upbeat color that adds visual punch and a high-energy feeling. Beware! It can also raise your blood pressure and induce hunger! If you are a very orderly person, white is an ideal for your kitchen color scheme, as it creates a sense of cleanliness and order. If white is too white, a soft gray might be a better choice for your kitchen. Gray has calming properties and also decreases hunger — but avoid using it heavily, it can also be depressing! Black is the new black! Black is a classic, elegant color choice for your kitchen, creating a feelng of depth and richness. In a large room, black will make the space feel warm and more intimate. However, in a small room, black is overwhelming, making the space feel too small and closed. Use it moderately unless you have a large kitchen. Green is a pleasing, tranquil color. 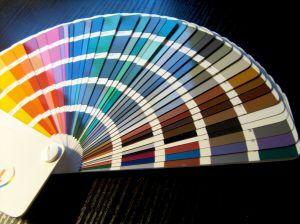 It’s your ideal choice if you want to create a feeling of nature. Even better, it can reduce allergic reactions to certain foods and lower blood pressure. For a sense of casual warmth, brown is your color. Various shades of brown can be used together to enhance the sense of natural comfort. Your kitchen is one of the most important areas of your home. This is exactly why you should design it to provide maximal comfort and efficiency? If you are not happy with your current kitchen, you should consider redesigning it to suite your taste. One of the most forgotten, but crucial element to having the kitchen of your dreams is good lighting. Most people spend all their time focusing on the rest of the kitchen, such as the cabinets, counters, appliances, etc. As a result, they forget about this important, yet most often forgotten part. 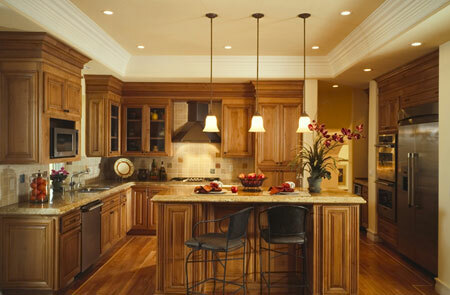 When looking for the right kitchen lighting, first decide what kind of atmosphere you want your kitchen to have. Kitchen lights come in an infinite number of varieties, so it is important to know what you are looking for first. You may choose to remodel your kitchen on your own, if you’re a DIY-type, however most of us will end up hiring a contractor for a kitchen remodel. 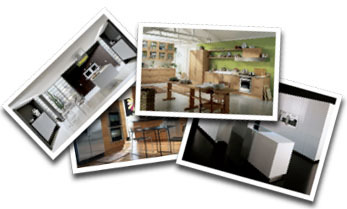 Hiring the best contractor(s) you can find is key to a successful kitchen remodel.